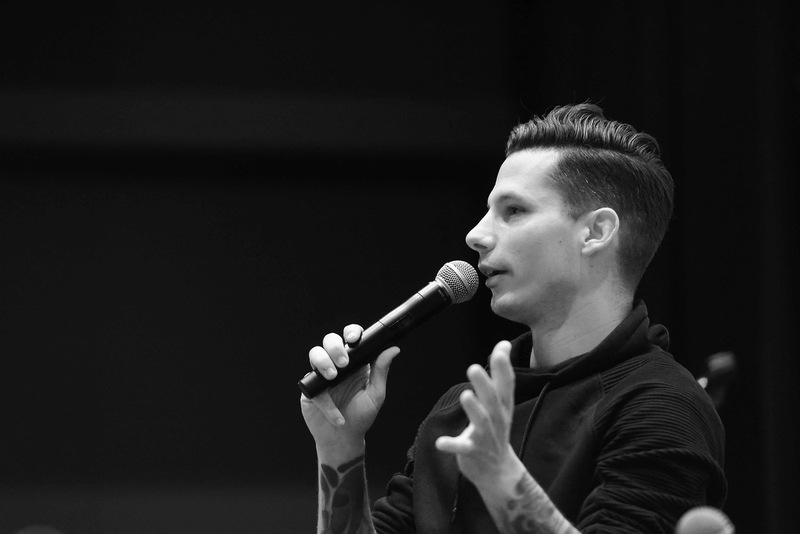 Devin Dawson Seminar speaks and performs at Belmont University in Nashville, Tennessee, January 26, 2018. Belmont alumnus and Warner Music Nashville artist Devin Dawson (’15) is making waves in the music industry with his first album, “Dark Horse,” releasing Jan. 19 and his single “All On Me” breaking the top 15 on Billboard Country charts. Dawson returned to campus Friday to discuss his career with current students. Dawson, who hesitated to join the music industry right away, said that Belmont was “the most amazing experience… I learned so much about myself through the people that I met” there. As for his success thus far? He attributes it to his “obsession” with songwriting. According to Dawson, songwriters and artists were like his baseball cards. He compared his knowledge of songwriters and music producers to children who have stats and figures of their favorite baseball players memorized. He said he attended as many convocation events and writers’ rounds as he could to expose himself to songwriters and their music.